Kat - Now here on the Naked Scientists, we're talking about beer. God I want a drink! And we welcome to the studio Dr Ray Marriott from Botanix Limited. Hi Ray! Kat - So your company is working on using carbon dioxide to extract chemicals from plants? Why do you want to do this? Ray - Well the main reason for using this technology is really to try to selectively take out the active molecules from plants so that they can be more easily used: more efficiently used, they can deliver more. In the case of hops CO2 happens to be a very good solvent and just to remove the bitterness and anti-microbial elements from hops that are actually so important in beer. Kat - So you're basically getting the good stuff out and leaving all the cruddy stuff behind? Ray - Yes, that's exactly right. Kat - Tell us a bit more about how the actual process works. Looking on your website it tells us about super-critical carbon dioxide and stuff, what are you doing to these things? Ray - Well, I think everybody thinks of carbon dioxide as a gas but CO2 can, of course be a solid as dry ice - a pure liquid, a condensed liquid. Or it can be a supercritical fluid. In liquid form and supercritical form it essentially behaves in both forms as a liquid. This can actually be passed through a column of plant material and in doing so it dissolves the materials that are soluble in that particular solvent liquid or supercritical CO2. These can be recovered using either a separator or an evaporator. And the carbon dioxide is then collected and reused and passed though the plant material. In this way, we can actually use the CO2 in what we call a 'closed loop system' to extract the active components from the plant material. Kat - So when you talk about solvents you normally think of sort of, organic solvents and chemicals. Why don't you use something like that? Ray - Well, using organic solvents of course is perfectly possible but they leave behind traces of the solvent within the material from which you've extracted. The beauty of CO2 is once you allow the extract to warm up, the CO2 just evaporates. Kat - Now this all sounds very space age, but is it actually being used to make the beer in pubs? Ray - Very much. Over 95% of the hops that are grown worldwide are processed in some way and about a third of those will be extracted using carbon dioxide and are used by many brewers as the basic ingredient for adding to the kettle. Chris - So before we had the ability to do this with carbon dioxide, would people have just chucked into the mix and let the flavour ooze out naturally? Ray - Yes, that's absolutely right. The whole cones of hops would have been put into the kettle. In doing that we have a relatively inefficient way of adding bitterness and aroma. 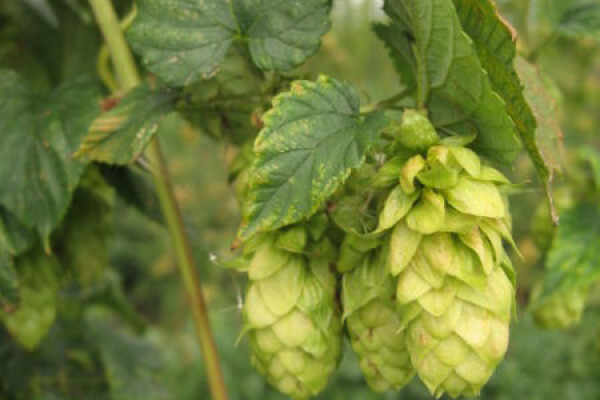 This is because the components that are so important in the hops are right in the very centre of the hop cone in what is called the lupulin gland. They have to diffuse out of that and then be soluble-ised to transfer the bitterness and the aroma into the liquid. That's relatively time-consuming and an inefficient way of doing it. Chris - And using that technique, how much of the potential flavourants would you have been able to recover from the hops: just waiting for it to ooze out that way? Ray - About a third of the potential bitterness and aroma can be obtained from the hops. Chris - That's not much. So you'd be throwing away potentially two-thirds of the goodness of the hops? Chris - And with your CO2 approach, how much can you get out that way? Ray - We extract about 95% of the component and they can then be added directly to the kettle or later on, even post-fermentation into the beer. Chris - And once you've got the hop extract, presumably you can see it in a bottle, what does it actually look like once the carbon dioxide has evaporated? Ray - It's just a very viscous orangey-yellow liquid. Chris - Does that mean you add it as-is or can you further sub-divide that and use different fractions of it to get different types of beer? Ray - You can use the extract exactly as it comes from the CO2 extractor and many brewers do. But yes, we can take that further and then separate that into what we call functional molecules of the hop. So if there's molecules that deliver bitterness, those that deliver aroma, those that deliver the anti-microbial activity of hops: these can all be fractionated and delivered to the brewer or even to the food industry in a very useable form. Chris - And this means that we can make beers, probably that you couldn't have made, without this technique. Ray - Yes, it does allow brewers to add bitterness and aroma completely independently instead of putting in a hop variety with a known ration of aroma they can add a certain amount of defined bitterness and a certain amount of aroma. It allows them to create all sorts of new types of beer. Chris - I'm very grateful to your company, Ray, for giving me such a wonderful drinking experience and I haven't forgiven you yet for turning up empty handed with no beer but just lastly, it strikes me that the same technique could be used to get all kinds of exciting molecules from plants. I'm thinking of nicotine from tobacco plants for nicotine replacement, I'm thinking of tetrahydrocannabinol from cannabis for making drug extracts that people might want to use for say, anaesthetics? Ray - Yes it is possible. There's a wide range of plant extracts that are used from delivering just flavour and aroma right through to active pharmaceutical molecules and this, what we call a 'clean-green' technology, I think will find increasing uses in this type of area. Chris - That's Ray Marriott, he's from Botanix limited. Thanks very much Ray. Ray's here in the studio if you'd like to ask him any questions you can email chris@thenakedscientists.com. Kat - I'm just wondering about the possibility of beer-flavoured food - it's incredible!